Tomorrow an all new Nike Air Trainer SC High will be released. 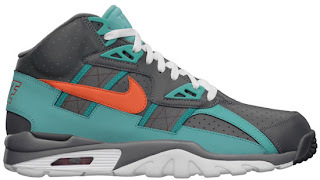 This pair, a "Miami Dolphins" inspired colorway. Featuring a dark grey-based upper with orange, turquoise blue and white accents. Designed to match the Miami Dolphins team colors. While we have seen a few Dolphins-inspired releases this year, this Nike Air Trainer SC High is a fresh take on the usual white-based designs. A general release, they will be available at select Nike accounts worldwide on Saturday, December 8th. Retail is set at $110. If you like what you see, check in with your local stores to see if they will be receiving the "Miami Dolphins" Nike Air Trainer SC High on December 8th. Those looking for them now can click here to grab a pair on eBay.